Intellexer SDK (semantic platform for knowledge analyses) is the core of our solutions. And all products are completely compatible with each other. Related Facts IE plug-in improves Google search by selecting 5 topics and supplementing them with related facts, relevant to custom search request. Make full use of Related Facts for Internet Explorer. 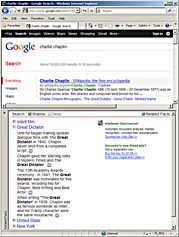 Download Related Facts IE plug-in and improve your Google search results. Summarizer IE plug-in creates precise summary of any Web page in English and extracts main concepts. IE Summarizer creates theme-oriented (e.g. politics, economics), structure-oriented (e.g. scientific article, patent) and concept-oriented summaries and highlights main concepts of the Web page. Download Summarizer plug-in for IE and send us your feedback via contact form. If you are interested in semantic software, we also encourage you to download Summarizer Pro v4.1 or try Summarizer Standard.